A 16-year-old Christian boy has been held on blasphemy charges in the Pakistani city of Karachi. The boy, named by police as Ryan Stanten, is said to have forwarded a text message which allegedly contained offensive material on Tuesday. The following day an angry crowd ransacked his family home, setting fire to their belongings on the street. Pakistan's blasphemy laws have been criticised for their severity and for being open to abuse. There has been renewed focus on the laws ever since a young Pakistani Christian girl was arrested in August on blasphemy charges after a mob accused her of burning the Koran. Following an outcry over the case, Rimsha Masih, who is thought to be 14 years old but with a younger mental age, was released on bail - an extremely rare move in blasphemy cases. Reports say the 16-year-old boy was taken to see local prayer leaders in Karachi after the message was sent on Tuesday. Police say the boy told the leaders he had forwarded the message without reading it to others in the middle-class compound for employees of the local gas company where he lived. His mother was employed by the gas company and reports say she has since been dismissed from her job. 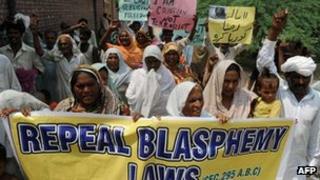 Blasphemy is a highly sensitive issue in Pakistan, where 97% of the population are Muslim. Critics say the laws are often used to settle personal vendettas. In the past, accusations of blasphemy have led to vigilante killings by mobs. Rights activists have long urged Pakistan to reform the laws, under which a person can be jailed for life or sentenced to death. In March 2011 Shahbaz Bhatti, the minister for minority affairs, was killed after calling for the repeal of the blasphemy law. His death came just two months after the murder of Punjab Governor Salman Taseer, who also spoke out about the issue.